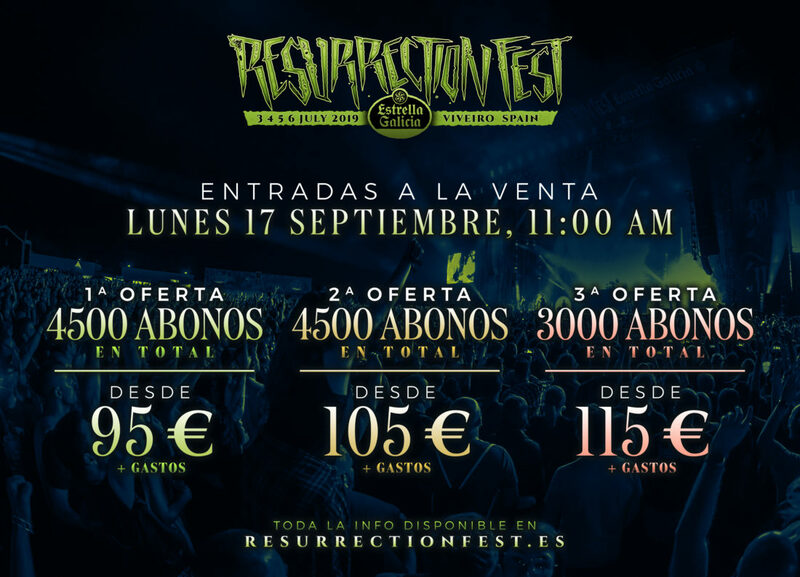 Next Monday 17th September at 11:00 am (Spanish time) we’ll release the first passes for Resurrection Fest Estrella Galicia 2019. We want to clarify all the different options, so check all the prices and how these offers work.  The sale will be online, exclusively on our website: tickets.resurrectionfest.es.  3-day and 4-day tickets will be on sale, being the 4-day ticket the one including the traditional Warm-Up Wednesday’s party.  There will also be Pandemonium tickets (VIP) for the 3-day pass and for the 4-day pass (a 3-day Pandemonium pass + regular Warm-Up ticket).  Single warm-up tickets will not be on sale for the time being, and as usual, all these tickets include the camping (not the paying camping areas). After finishing the third offer, the price will be increased and will stay the same until further notice. We want to remind you that during the last years the first offers were sold-out in the same day, so stay tuned and be on time. We also want to communicate that Resucamp, Beachcamp, Glamping, Warm-up, lockers and our official trips will be on sale later, and that we’re working really hard to have a second big bands announcement asap, so they can join the already announced bands Parkway Drive, Trivium, Testament, Kvelertak and While She Sleeps. See you on Monday at 11:00!